Recombinant full length protein corresponding to GFP. The total IgG concentration has been determined to be 5 mg/mL. The specific IgG concentration is unknown. This product should be kept refrigerated at all times whilst in short term storage. Using sterilised equipment will reduce the risk of bacterial contamination. ab290 is a highly versatile antibody that gives a stronger signal than other anti-GFP antibodies available. 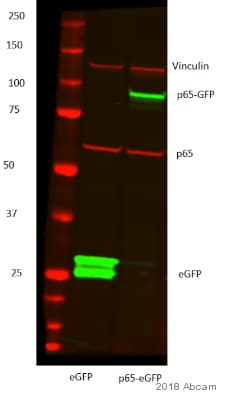 On Western blot the antibody detects the GFP fraction from cell extracts expressing recombinant GFP fusion proteins and has also been shown to be useful on mouse sections fixed with formalin. In Immunocytochemistry, the antibody gives a very good signal on recombinant YES-GFP chimeras expressed in COS cells (McCabe et al. 1999 and figure below). It is routinely used in Immunoprecipitation (IP) and IP-Western protocols and has been used successfully in HRP Immunohistochemistry at 1:200 on whole-mount mouse embryos. 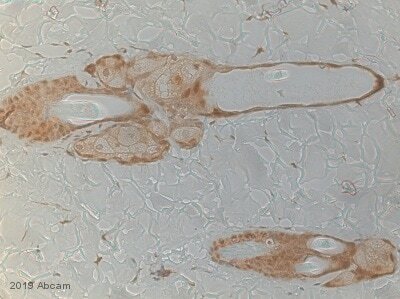 ab6556 is the purified version of this antibody (see Related Products). This anti-GFP antibody recognizes the enhanced form of GFP as well. Recognises EYFP (Yellow Fluorescent Protein (YFP), a genetic mutant of green fluorescent protein (GFP). ab290 also detects venus YFP. Abcam recommended secondaries - Goat Anti-Rabbit HRP (ab205718) and Goat Anti-Rabbit Alexa Fluor® 488 (ab150077). See other anti-rabbit secondary antibodies that can be used with this antibody. Shipped at 4°C. Store at +4°C short term (1-2 weeks). Upon delivery aliquot. Store at -20°C or -80°C. Avoid freeze / thaw cycle. This antibody is provided as whole antiserum. It is not possible to determine the exact antibody concentration, since whole serum contains many other host serum proteins besides the antibody of interest. Our Abpromise guarantee covers the use of ab290 in the following tested applications. The application notes include recommended starting dilutions; optimal dilutions/concentrations should be determined by the end user. Flow Cyt 1/50 - 1/300. See Abreview section for protocols. Also, ab171870 - Rabbit polyclonal IgG, is suitable for use as an isotype control with this antibody. ELISA Use at an assay dependent concentration. 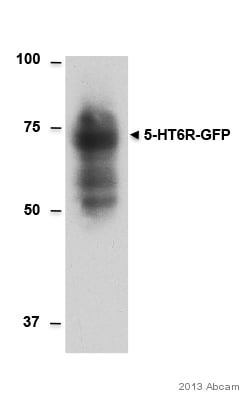 We recommend Goat Anti-Rabbit IgG H&L (Alexa Fluor® 488) (ab150081) secondary antibody. ChIP Use at an assay dependent concentration. IHC-FrFl Use at an assay dependent concentration. 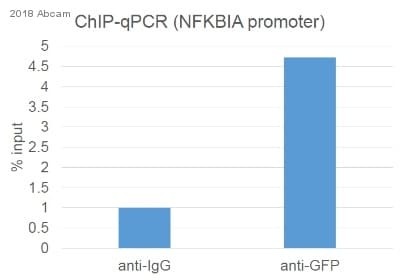 ChIP/Chip Use 5 µg for 1 µg of chromatin. See Abreviews section for protocols. Also see PubMed ID 17289569 for more information. Electron Microscopy 1/1000 - 1/4000. IHC-P 1/500 - 1/1000. Perform heat mediated antigen retrieval via the microwave method before commencing with IHC staining protocol. IHC-Fr Use at an assay dependent concentration. Reported to work at dilutions up to 1/3000. Use secondary antibody Goat Anti-Rabbit IgG H&L (Alexa Fluor® 488) (ab150077). IP Use at an assay dependent concentration. Use at 1µl per 10cm tissue culture dish (use 10µl protein A agarose CL4B to precipitate the immune complex). It is recommended to use 12.5% SDS-PAGE and to transfer to PVDF membrane. Use 1x Blotto (or 3% BSA in PBS) for diluting and blocking. Use PBS in 3x 5min washing steps throughout the immunolabelling. Probe with ab290 at 1:1000 - 1:5000 dilution and use Goat Anti-Rabbit IgG H&L (HRP) (ab205718) at 1:5000 dilution with ECL detection method. ab290 has been reported to work at 1:50,000 and dilutions around this range should be tested if high background is seen. Both incubation steps should be for 1hr at 22°C. Function: Energy-transfer acceptor. Its role is to transduce the blue chemiluminescence of the protein aequorin into green fluorescent light by energy transfer. Fluoresces in vivo upon receiving energy from the Ca2+ -activated photoprotein aequorin. Post-translational modification: Contains a chromophore consisting of modified amino acid residues. The chromophore is formed by autocatalytic backbone condensation between Ser-65 and Gly-67, and oxidation of Tyr-66 to didehydrotyrosine. Maturation of the chromophore requires nothing other than molecular oxygen. Biotechnological use: Green fluorescent protein has been engineered to produce a vast number of variously colored mutants, fusion proteins, and biosensors. Fluorescent proteins and its mutated allelic forms, blue, cyan and yellow have become a useful and ubiquitous tool for making chimeric proteins, where they function as a fluorescent protein tag. Typically they tolerate N- and C-terminal fusion to a broad variety of proteins. They have been expressed in most known cell types and are used as a noninvasive fluorescent marker in living cells and organisms. They enable a wide range of applications where they have functioned as a cell lineage tracer, reporter of gene expression, or as a measure of protein-protein interactions. Can also be used as a molecular thermometer, allowing accurate temperature measurements in fluids. The measurement process relies on the detection of the blinking of GFP using fluorescence correlation spectroscopy. Sequence similarities: Belongs to the GFP family. Exhibits a smaller absorbance peak at 470 nm. The fluorescence emission spectrum peaks at 509 nm with a shoulder at 540 nm. IHC - Wholemount - Anti-GFP antibody - ChIP Grade (ab290)Image from Fitzsimons HL et al., PLoS One. 2013;8(12):e83903. Fig 2.; doi: 10.1371/journal.pone.0083903. Characterisation of HDAC4-trapped pGAL4-driven expression using anti-gfp antibody ab290. A. Molecular organisation of the HDAC4 gene locus. The 22.6 kb locus is shown, with exons depicted as boxes. Translated regions are black boxes. The P element transposons NP3558 and NP1617 are inserted 3144 and 4838 bp downstream from the 3' end of the 2nd exon, respectively. The site of YFP insertion into HDAC4:YFP at 1310 bp downstream from the 3' end of the 2nd exon is also shown. YFP is flanked by splice sites, which facilitate internal incorporation of YFP into the HDAC4 protein. B-D. Confocal microscopy images of whole mount brains with NP1617-driven expression of nuclear localized dsRED and CD8::GFP. B. Frontal confocal projection through the brain showing CD8::GFP in the mushroom body and nuclear localized dsRED in the Kenyon cell nuclei. Some expression can be seen at lower levels in other regions of the brain. Scale bar = 200 μm for B,C,E,F. C. Posterior view showing CD8::GFP localized to the calyx and nuclear localized dsRED in the Kenyon cell nuclei. D. CD8::GFP expression is observed in α/β and γ lobes of the MB. Immunohistochemistry against Trio (blue) which is expressed in the α'/β' and γ lobes of the mushroom body, confirms co-localization of GFP with Trio in the γ but not the α'/β' lobes. Scale bar = 50 μm for D and G.
E-G. Confocal microscopy images of whole mount brains with NP3558-driven expression of CD8::GFP. E. Frontal confocal projection showing CD8::GFP in the mushroom body and widespread through the rest of the brain. F. Posterior view showing high expression of GFP in the Kenyon cells. G. Anti-Trio immunohistochemistry reveals colocalization of GFP and Trio in the α'/β' and γ lobes, and GFP is also observed in the Trio-negative α/β lobes. Immunohistochemistry (Formalin/PFA-fixed paraffin-embedded sections) - Anti-GFP antibody - ChIP Grade (ab290)Image from Yang C et al., PLoS One. 2013;8(11):e79615. Fig 2.; doi:10.1371/journal.pone.0079615. Bone marrow-derived infiltrating cells in the stromal tissue of gastric intraepithelial tumor traced by GFP direct fluorescence. 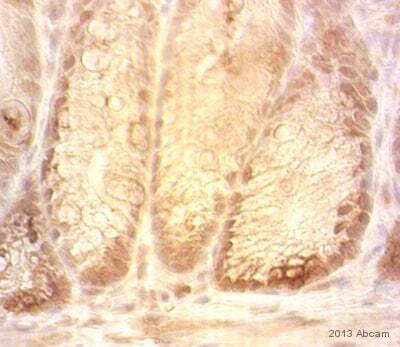 (A) Normal tissues of the glandular stomach of a regular GFP(−) control mouse. (B) Normal tissues of the glandular stomach of a GFP(+) transgenic control mouse; (C, E, D, F) An induced gastric intraepithelial neoplasia (GIN) in a bone marrow transplanted mouse. GFP(+) BMDCs tracked with direct fluorescence localized in the GIN stromal tissue are shown in C and E. The same GIN lesion slide stained by H&E after the fluorescence observation are shown in D and F. DAPI (A–C and E) and hematoxylin (D and F) are used to visualize nuclei, respectively. Locations of the images C and D in the images E and F, and the image E in the image F are marked in the corresponding color. The gastric glands and stromal cells are also labeled. 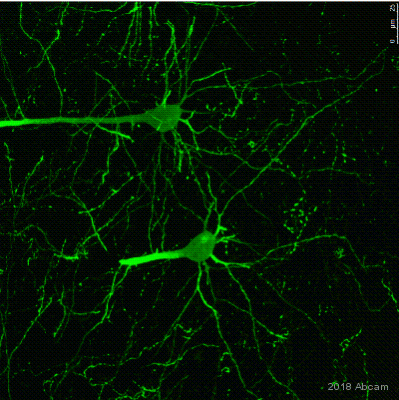 Immunohistochemistry (Free Floating) analysis of mouse brain tissue sections labelling GFP with ab290. Tissue was fixed with 4% PFA, frozen 30 µm sections were blocked for 1 hour at room temperature with 10% normal goat serum + donkey anti-mouse IgG Fab fragments (0.1 mg/ml). Sections were incubated with the primary antibody at a dilution of 1/1000 in TBS + 0.25% Triton-X for 16 hours at 4°C. A Cy2®-conjugated donkey anti-rabbit IgG (H+L) at a dilution of 1/200 was used as the secondary antibody. Image shows anti-NeuN (red), DAPI (blue), and anti-GFP staining of GFP-cre (green, yellow with NeuN colocalization). ab290 staining dog hearts (Adv-GFP injection) tissue sections by IHC-P. Sections were PFA fixed and subjected to heat mediated antigen retrieval in citric acid (Ph6.0, 0.05% Tween20) prior to blocking with 10% serum for 30 mins at 37°C. The primary antibody was diluted 1/1000 in PBS and incubated with the sample for 1 hour at 25°C. A HRP conjugated secondary like Goat Anti-Rabbit IgG H&L (HRP) (ab205718) was used. Immunofluorescence images showing similar localization of Yes-GFP (first 10 aa's of Yes PTK fused to the N-terminus of GFP) to full length Yes PTK. A: Distribution of Yes detected using mouse anti-Yes Ab followed by Texas Red-conjugated anti-mouse Ab. B: Chimeric GFP's detected using rabbit anti-GFP Ab (Abcam ab290) followed by FITC-conjugated anti-rabbit Ab. ab290 immunoprecipitating GFP in HEK293 nuclear lysate expressing GFP. 20µg of lysate was incubated with primary antibody (1 µg/mg lysate) and matrix (Protein G) for 16 hours at 4°C in AFC low salt buffer. For western blotting ab290 (1/5000) was used to confirm successful immunoprecipation. Lane 1: HEK293 nuclear lysate expressing GFP input. Lane 2: IP of HEK293 nuclear lysate expressing GFP. Lane 3: Cells with no GFP. ab290 staining GFP in GFP-transfected NIH3T3 cells. The cells were fixed with 4% formaldehyde (10min) and then blocked in 1% BSA / 0.3M glycine in 0.1%PBS-Tween for 1h. The cells were then incubated with ab290 at 1/200 dilution overnight at +4°C followed by incubation with Goat Anti-Rabbit IgG H&L (Alexa Fluor® 488) (ab150081), for 1 hour, at 1μg/ml. Under identical experimental conditions, when compared to the basal level of GFP expression in transfected NIH3T3 cells, the cells upon which ab290 was applied gave a stronger signal in the 488 channel, indicating that ab290 is binding to GFP and therefore eliciting signal amplification. ab290 was also applied to non-GFP-transfected NIH3T3 cells, which produced no positive staining, indicating specificity for GFP. Nuclear DNA was labelled with 1.43μM DAPI (blue). ab290 immunoprecipitate in human HEK293 cells transfected with Annexin1-GFP. 25µg of cell lysate was incubated with the primary antibody and matrix (Protein G) in 1% TX-100, 10% glycerol, 1X PBS for 16 hours at 4°C. For Western blotting anti-rabbit HRP conjugated secondary antibody was used at a dilution at 1/5000. Lane 1: Lysate of HEK293 cells expressing Annexin1-GFP fusion protein. Lane 2: IP with anti-GFP. Lane 3: Not bound fraction. Flow Cytometry - Anti-GFP antibody - ChIP Grade (ab290)Image is courtesy of an anonymous Abreview. Flow cytometry analysis of paraformaldehyde-fixed human differentiated hNSCs cells prepared through accutase, quantifying GFP with ab290 diluted 1/300 incubated for 20 hours at 25°C. Permeableization was through 0.25% Triton X-100 in DPBS. 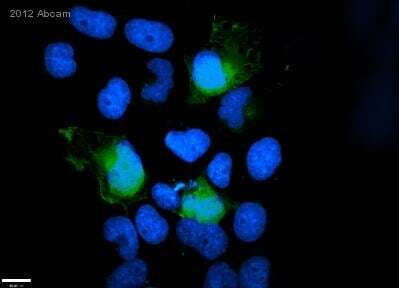 Secondary was anti-rabbit Alexa Fluor® 488 conjugated secondary antibody was used at 1/500. The gating strategy was against undifferentiated stem cells (shown in white). ab290 staining GFP in U2OS cells expressing TRF2-GFP fusion protein by ICC/IF (Immunocytochemistry/immunofluorescence). Cells were fixed with formaldehyde, permeabilized with NP40 and blocked with 3% BSA for 1 hour at 21°C. Samples were incubated with the primary antibody (1/1000 in PBS + 3% BSA) for 12 hours at 4°C. An Goat Anti-Rabbit IgG H&L (Alexa Fluor® 488) (ab150077) at a dilution of 1/500 was used as the secondary antibody. Developed using the ECL technique. why is the actual band size different from the predicted? Lysates/proteins at 20 µg per lane. Blocked with 5% milk for 1 hour at 23°C. Incubated with the primary antibody for 16 hours at 4°C. Observed band size: 30 kDa why is the actual band size different from the predicted? Blocked with 5% milk for 1 hour at 20°C. Incubated with the primary antibody for 18 hours at 4°C in TBS containing 2% milk and 1% Tween. Predicted MW of Eml4 ~ 120 kDa. Publishing research using ab290? Please let us know so that we can cite the reference in this datasheet. Abcam guarantees this product to work in the species/application used in this Abreview.